Its not too often you have two chart topping billboard artists on one bill alongside the highest selling dancehall single ‘Nobody Have to Know’ artist for 2014. 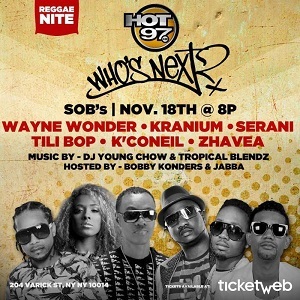 On Tuesday November 18th, Wayne Wonder, Serani and new dancehall sensation Kranium will perform live inside the world renown SOBs for the last Reggae edition of Hot 97 Who’s Next series for 2014. Also on this heavy line up will be young rising artist K’Coneil whose single ‘Gyal a You’ continues to play on Caribbean radio and Zhavea who is currently buzzing on Jamaican radio with her new single feat. Beenie Man “Gimme That Love’. To top off the line up is dancehall artist Tilibop whose journey many may remember yet have a hot new single titled ‘Lights Out’. Hot 97 Who’s Next Reggae Edition will be a night you dont want to miss. Tickets are currently on sale at www.sobs.com. Doors open at 8:00 pm Come out Early!